While traditionally temples have only one swayambumurthy, this is one with 11 Swayambumurthis – Lord Thothadri Nathar in the sanctum sanctorum, Mother Sridevi and Bhoodevi, Sun, Moon, Maharshis Brugu and Markandeya, dancers of the celestial world Uruvasi and Thilothama. Of the 8 Vishnu Swayambumurthis, the one in Badrinath in north is covered by fog for six months. Here, the Lord is available for the devotees throughout the year. Gingelly oil abishek is performed to Lord Thotadrinathar throughout the year. 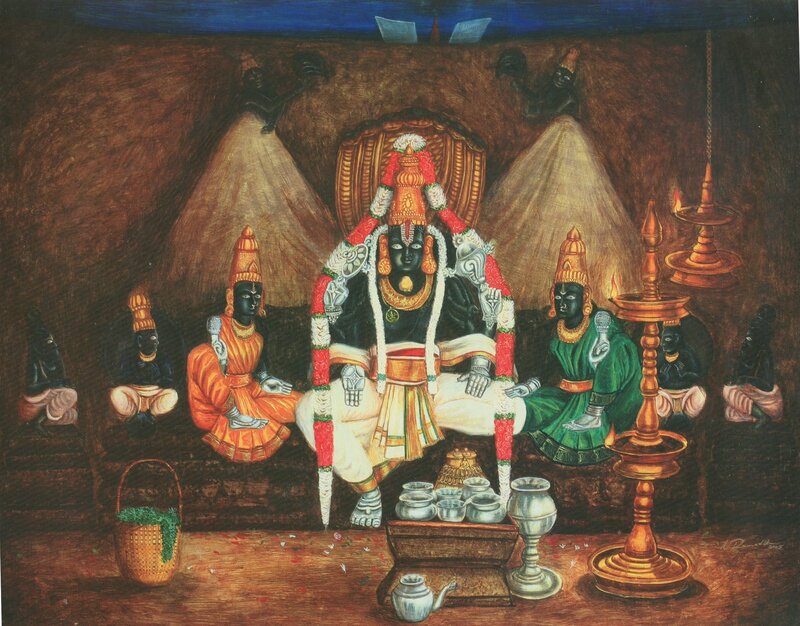 The story relating to Thothadri finds reference in Brahmanda Puranam, Skanda Puranam and Narasimha Puranam.It is said that Lord Shiva narrated the story and the significance and greatness of Thothadri and Varamangai to Sage Narada, who having heard the story is believed to gone to Vaikuntam and heaped praised on Narayana. 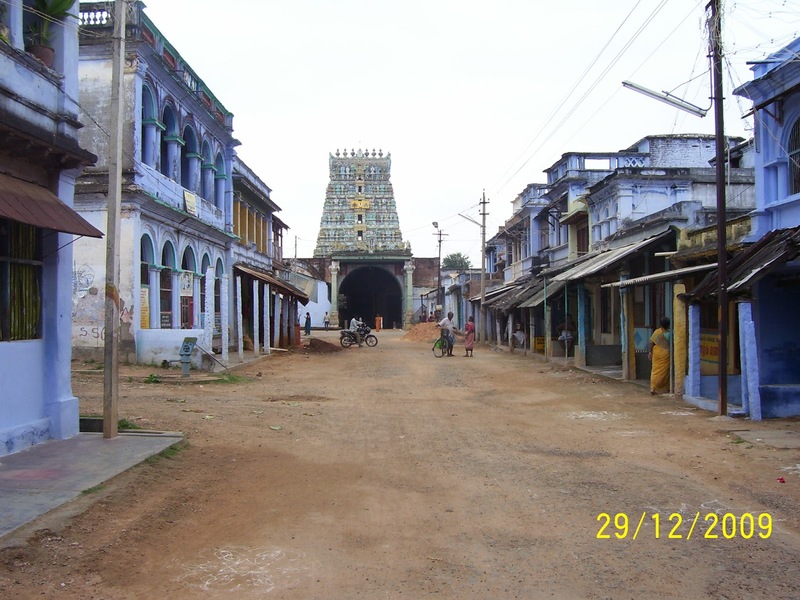 Adisesha undertook penance here and hence this place came to be called ‘Naaganai’ Cheri. As the huge lake around the temple was split into 4 canals, this place was referred to as ‘Nangu’ ‘Eri’. 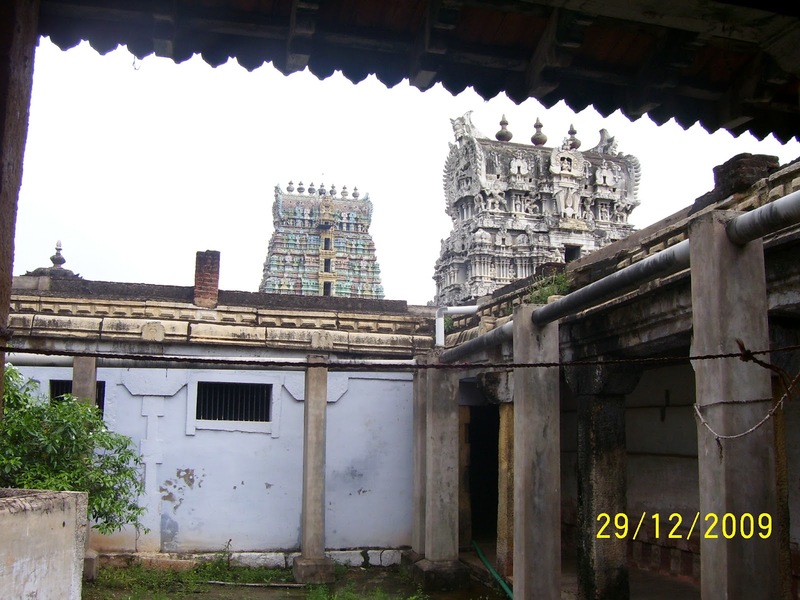 Goddess Lakshmi grew up at Thothadri as Varamangai and later met and married the Lord here. 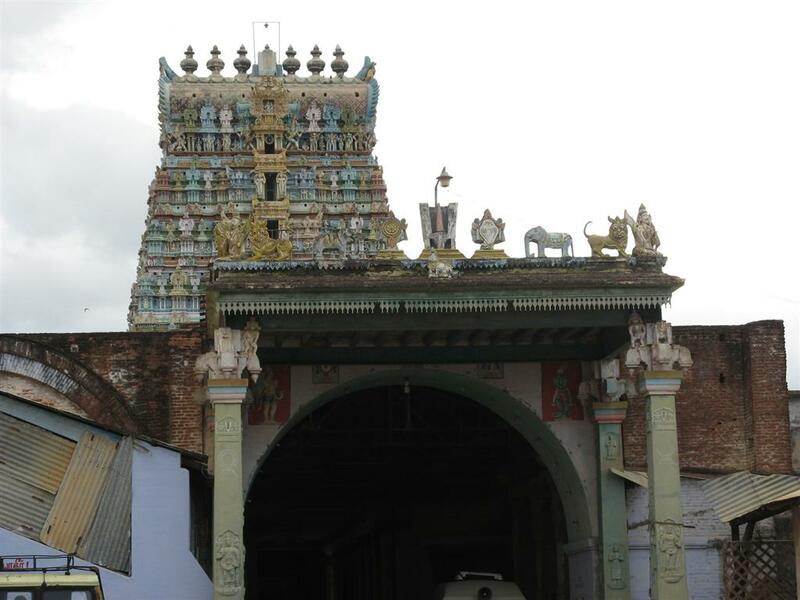 Hence, this place is also referred to as SriVaramangai. In Azhvaar’s praise of the Lord here, he refers to him as the Lord of Varamangai Nagar. This is one of the eight sacred Swayam Vyaktha Vishnu Sthalams, the others being Srirangam, Srimushnam, Tirupathi, Saligramam, Naimi Saranyam, Pushkaram and Badrinath. A Sindhu king on a hunting expedition consumed food from the ashram of Gusasana Rishi while he was away. An angered rishi cursed him to turn to a dog. A man trained the dog to provide acrobatic displays to onlookers and thus earned his livelihood. After going all over the place, the dog was finally relieved from the curse after a bath at the sacred water (Chethruththamarai Theertham) at Thothadri. He regained his princely form. Hence, it is believed that a bath at this Theertham will relieve from all curses. Kaarya Maharaja didn’t have a child. He went to Lord Nambi at Thirukurungudi who asked him to undertake pooja of the Lord who is present beneath the earth at Nanguneri. The king who dug up the earth here was shocked to find blood oozing out of the Lord’s head. The Lord asked him to perform an Oil Abhishekam and to throw the oil into the open well found at this place. Having performed this, he is said to have had children. The temple is believed to have been built by Kaarya Maharaja. The tradition of Oil Abhishekam has come to stay. Hence, the speciality of this Divya Desam is the daily oil pooja for the main deity and depositing the oil in the 25 feet open well inside the temple. The oil has been hailed by Sage Agastya as ‘Sarva Roha Nivarani’ and is said to have medicinal values helping cure both internal and external illness including ulcer and skin diseases. The oil at this temple is just as special as the ‘laddu’ of Tirupathi temple. The story goes that Kasiyap, who had two wives- Kathru and Vinathai, remained childless. Invoking the blessings of a rishi, the two wives were given the option of choosing between several children and just the two. Kathru had several children including Adisesha, the Serpent King, on whom Lord Vishnu rests himself. Vinathai had two children- Arunan (Charioteer of Surya) and Garuda (Charioteer of Vishnu). With Lord Vishnu resting himself all the time on Adisesha, an upset Garuda undertook penance at Thothadri. When the Lord appeared before Garuda, he expressed his disappointment at not accorded the same status as Adisesha. It was then that Lord Narayana asked him to come with him to Vaikuntam and accorded him the status of standing in front of him (facing him) ready all the time to take his Lord on a trip. Thus it came to be that when the Lord leaves Adisesha, he gets on to Garuda. Goddess Earth felt impure after blood and bones of asuras Madhu and Kaitapa fell on Earth after being killed by Lord Vishnu. She undertook penance at Thothadri near Mahendra Hills. Lord appeared in front of her and relieved her from the impurities by showering the nectar on her. As per her wishes, he remained seated under the Vaikunta Vimanam and provided darshan to all devotees. The two beautiful damsels Urvasi and Thilothama undertook penance at Thothadri seeking liberation from re-birth and with the single minded devotion of serving the Lord. Narayana, who appeared before them, expressed surprise at these two beautiful ladies undertaking severe penance at Thothadri instead of enjoying their lives. The two replied that they had now realised that serving him was the ultimate achievement for any one. As desired by them, Lord allowed them a place next to him. Hence, they are seen here at this temple next to the Lord in a gesture of fanning him (white Chamaras) and keeping him always cool. 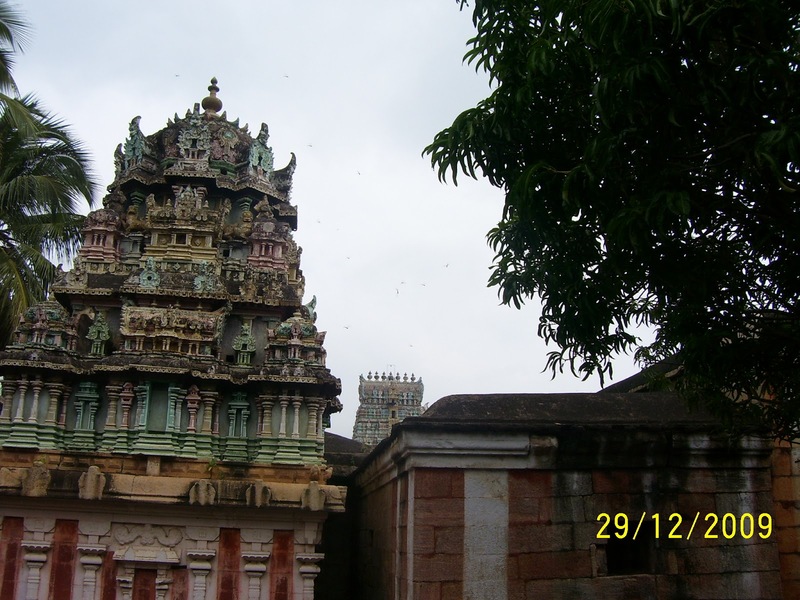 The vimana-tower above the sanctum is of Nandavardana design. Lord Brahmma, Indira, king of Sindhu, Garuda Baghwan, Urvasi, Thilothama were blessed with the darshan of Lord in the temple. Gingelly oil abishek is performed to Lord throughout the year. This abishek oil is stored in a well. Those suffering from skin problems apply this on their body and consume a few drops for total cure. Festival: Chithirai Brahmmotsavam in April-May and the second in Panguni (March-April) are the two festivals of importance in the temples besides festivals related to Lord Vishnu. The temple is open from 07:00 a.m. to 12:00 noon and from 05:00 p.m. to 09:00 p.m. Located about 30kms South of Tirunelveli, off the Nagercoil Highway and about 10kms from Thiru Kurungudi Divya Desam is Vaanamaalai Thothadri Nathan Divya Desam at Nanguneri. Buses are available every 10 minutes between Tirunelveli and Nagercoil (Nanguneri can be reached within 45minutes from Tirunelveli bus stand).